There’s an old-fashioned way of writing down your secret thoughts, feelings and experiences. Apparently, you get to keep a secret journal that you usually hide under your bed. It’s a journal with a lock and only you hold the key but as time goes by, the pages in your secret journal have already been filled. The time has come for you to get a new one but since we are now living in a modern age, wouldn’t it be better if you use a free diary app like Secret Diary for Android? 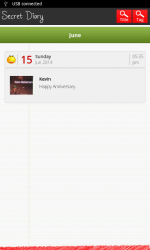 Secret Diary is a free diary app for Android that you can lock with a pattern or password. It is basically a simple app wherein you can record your daily activities and experiences plus, it also flaunts a built-in calendar. With Secret Diary, you can conveniently write down your thoughts and feelings regardless of the place or time. You can even attach a photo to your entries and once you’re done, you can just lock it up so that no one would be able to read what you’ve written. Secret Diary uses a pattern lock to secure your journal entries. 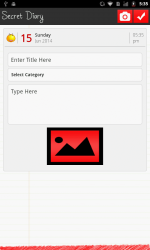 It is a very simple and straightforward diary app so you can’t really expect it to provide you with advanced tools and options. Upon launch, you are greeted by the app’s calendar. The calendar is set into monthly view so you just press the forward and back arrows to scroll the rest of the months. To set a secret pattern for the app, just tap its main settings button which is located on the top-right corner of the screen. You will then be asked to enter your desired secret pattern and then you also need to choose a security question just in case you forget your secret pattern. Once you’re done, just go back to the app’s calendar view and then select the date that you want. Notice the plus icon on the top-right corner of your screen? Just press it to add a new note or journal entry. Thereafter, just fill in the required fields like the journal title, category, etc. Once done, simply type anything that you want. You can write your thoughts, fantasies, feelings, ideas, experiences, etc. You can also attach one photo to your journal entry. To do so, just tap the camera icon then take a picture of anything using your device’s camera app. The only downside to this feature is that you cannot insert a photo from your gallery. After writing down your journal entry, you can also set an emoji to express your mood for that day. The app offers a variety of cute and cool emojis so feel free to choose the one that you like. Once you are done, just save your entry then go back to the app’s calendar view. You will then notice that your new entry has been stored and listed to its corresponding date. All in all, I find Secret Diary really easy to use. It’s just that it lacks a lot of good features. It even lacks an option to filter or narrow down your search. There’s no search tool or whatsoever. You also cannot sort out your notes and entries by date, color, name, etc. Plus, it lacks support for password or PIN lock and you can’t switch its UI orientation to landscape mode. The good thing about Secret Diary is that it supports devices that are running on older Android OS versions. Thus, you can install it on your old smartphone or tablet. I also like the fact that you can attach photos to your entries. However, if your device is fully capable of running a more advanced diary app, better try using Private DIARY Free  or Diaro.